'Bug: The Adventures of Forager' #4 Review – AiPT! 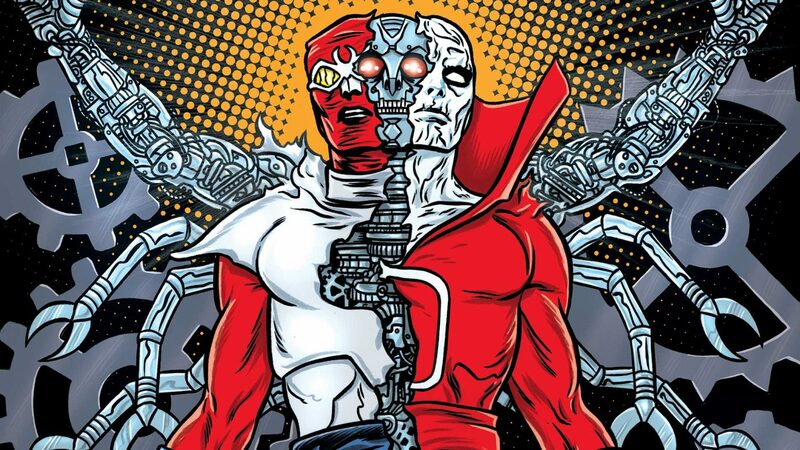 Forager’s bizarre, trippy and hilarious tip through the DC universe continues with an unexpected stop to save Deadman. Brothers Michael and Lee Allred continue their bizarre journey through the Jack Kirby universe through the eyes of Forager in Bug! The Adventures of Forager #4. If it weren’t for the current Doom Patrol, Bug! would have sole possession of the “weirdest DC Comic” title. Through the first three issues, Bug has gone to all corners of the DC universe, bumping into as many Kirby characters as possible along the way. In #4, he runs into Deadman. Oh, this should be fun. Bug meets Boston Brand, known more commonly as Deadman, one-time circus performer turned nomadic ghost. Deadman has now become trapped in a robotic body, and Bug’s chase through dimensions and realities may just be the key to breaking the spook out of his tin can. “Hook, Lion & Stinker” picks up right where we left off last month, when Forager “killed” the Mother Entity by creating a Negative Boom Tube with his Mother Box. Now, all the Mother Boxes in the known universe have suddenly stopped. Although this is quickly remedied when he realizes that he can actually spin cocoon goo to heal her, he still has to find Chagra. But along the way, Bug and his companions – the young girl Kazuko and his talking teddy bear – get distracted. Bug visits with The Sandman and falls through a dimensional vortex with Tatsinda (a character so obscure she doesn’t even appear to have page at the DC Comics Database Wiki) before he finally meets with Deadman. And of course, Boston Brand has his own problems because he’s stuck in a robot. Are you sufficiently weirded out by this comic book yet? You’re not! OK, then if you plan on sticking around, you are in for a treat. The inside jokes from Lee Allred that demolish the fourth wall (or should I say Fourth World?) left and right are bits of pure joy. (“By the way, did you know there’s another costumed type running around calling himself Sandman? You guys got a franchise or something?”) And Michael Allred’s art, complemented by his wife Laura Allred’s vibrant colors, is like seeing pop art come to life. Yes, as we’ve noted before, the story still doesn’t make too much sense and it’s very episodic, but it’s so much fun. I’m sure Forager will get to wherever he’s going by the end of issue six. But hopefully he won’t so DC can convince the Allreds to make this a never-ending adventure that lasts at least long enough to see Etrigan The Demon meet a talking stuffed bear. The issue also includes a brief back-up story from James Harvey that tracks the odd adventures of Midnight, originally a Spirit-like character created by Plastic Man’s Jack Cole, in the Phantom Zone. Bug! The Adventures of Forager #4 continues Forager's bizarre, trippy and hilarious trip through the DC universe with an unexpected stop to save Deadman. It's weird, it's bizarre and there's a talking teddy bear. If this can't sell you on a comic book, I have no idea what will. Mike Allred's art is fantastic and tied in perfectly with the humor of the script. The story is still very episodic, with Forager tripping through DC worlds.